Intelligent Transportation System (ITS) is the synergy of information technology, real-time control, and communication networks. The system is expected to perform more complex traffic arrangements, in particular, traffic management of Emergency Vehicles (EV) such as fire trucks, ambulances, and so forth. Implementation of traffic management using only Traffic Signal Pre-emption does not give enough space for an EV to cross an intersection safely, especially on streets where there is only one lane. This paper proposes a model of accelerated emptying of traffic in front of EVs. Accelerated emptying model uses historical approach, based on current characteristics of traffic. For example, if the normal vehicle speed is equal to the EV speed before accelerated emptying, the system indicator will be 0%, thereby indicating no need for accelerated emptying. Similarly, a negative system indicator result means an accelerated emptying process is not necessary. However, if the system indicator is close to 100%, this result indicates accelerated emptying is necessary. Researchers around the world have concerned themselves with how to efficiently exploit capacity of the existing transportation infrastructure (Sumaryo et al., 2014). Intelligent Transportation System (ITS) was proposed to solve traffic problems; it consists of information technology, real-time control, and network communications. ITS researchers have received considerable attention worldwide, including: Kim and Mahmassani (2015); Lim (2016); Lopez-Garcia et al. (2016); Loorbach and Shiroyama (2016); Mannion et al. (2016); Hassn et al. (2016). The transportation system is a complex and dynamic system that is difficult to model with precision (Li et al., 2007). However, without proper modeling, characteristics of the transportation system cannot be properly identified for the purpose of evaluating existing methods and identifying potential problems. Traffic flow modeling, using queuing theory, has been performed by numerous experts (Yang & Yang, 2014; Fuyu et al., 2014; Sumaryo et al., 2015).One traffic problem identified in traffic flow modeling is the management of Emergency EV such as fire trucks and ambulances (Sumaryo et al., 2014). Signal control for handling EV requires a pre-emptive control, designed and operated to give the most important classes of vehicles the right-of-way through a signal or intersection (Kittelson & Associates, Inc., 2008). Many researchers have examined the appropriate method for pre-emptive control (Huang et al., 2011; He et al., 2011; Shruthi & Vinodha, 2012; Goel et al., 2012; Kuang & Xu, 2012; Chakraborty et al., 2014). Research shows that some benefits associated with traffic signal pre-emption include: improved response time/travel times for EV; improved safety; and, reliability for vehicles receiving pre-emptive right-of-way (Kittelson & Associates, Inc., 2008). 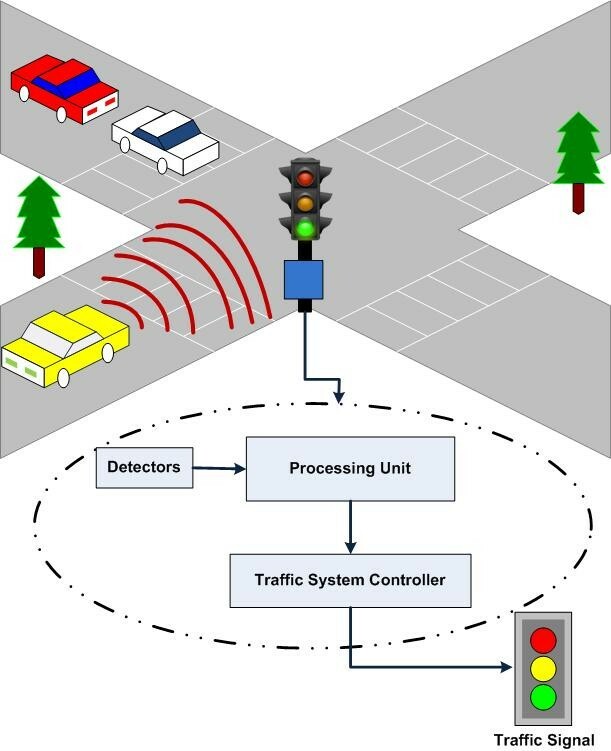 There are several technologies available for the detection of vehicles that invoke pre-emptive arrangements, including: lights, siren sounds, pavement loops, and radio transmissions (Kittelson & Associates, Inc., 2008). These technologies are activated when the vehicle is approaching the intersection. Figure 1 (below) shows an example of how the pre-emptive process is activated. First, the vehicle sends a priority signal to the detector or sensor as the EV approaches the intersection. The detector then sends a signal to the processing unit. Next, the processing unit sends an activation request for the pre-emptive sequence (i.e. extended green signal or red truncation signal) to the traffic system controller. Finally, the controller sends a request to the traffic signal. At present, considerable research exists on the implementation of pre-emptive arrangements (Wang et al., 2013; Hashim et al., 2013; EShanthini & Sreeja, 2016). However, implementation using only traffic signal pre-emption is not enough to give adequate space for an EV to cross an intersection safely. Therefore, additional processes are necessary, such as accelerating the discharge of vehicles in front of the EV. Discharging congestion in front of EVs is crucial, especially if the road has only one lane. Most experts have only briefly considered emptying vehicle congestion in front of EVs (Huang et al., 2011; Kamalanathsharma, 2010; Wang et al., 2013). Until now, studies have not examined means of promptly reducing lane traffic congestion in front of EVs. In 2011, the procedure proposed by Huang, Yang and Ma identified a need for accelerated discharging at a vulnerable position of congestion. However, the research did not develop a process for emptying. In 2010, Kamalanathsharma’s research only identified the time required by the last vehicle in the queue to reach the intersection. While this did provide a basis for determining the pre-emptive offset, again the research lacked further development of an emptying process. Likewise, the research conducted by Wang et al. 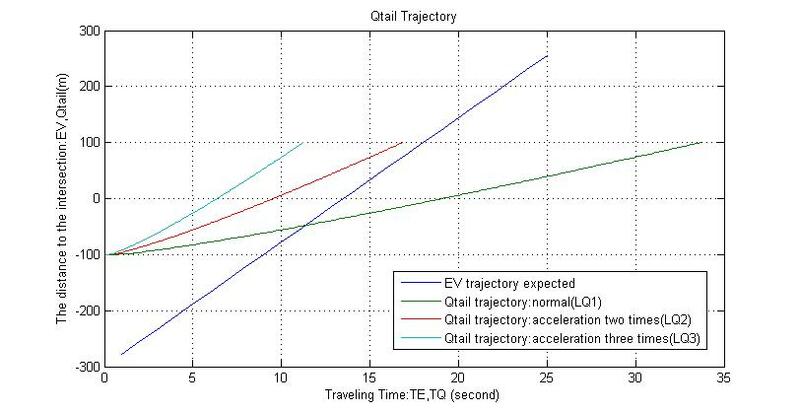 (2013) predicted the time required for emptying the queue based on queue history, but their approach did not guarantee the avoidance of collision to a normal vehicle in front of the EV by the EV. This research was aimed to develop a method and model for accelerated discharging of traffic in front of an EV at a single intersection. Accelerated discharging is the process of emptying a queue of normal vehicles immediately in front of the EV at the arm of the intersection. The method developed by Wang et al. (2013), is a pre-emptive extension system called TONGJI-Signal Emergency Vehicle Pre-emption System (TJ-EVSP) that can be applied to other pre-emptive systems. The proposed method and model of accelerated emptying presented here follows an historical approach. The tail of the queue path does not intersect with the trajectory of the EV across the intersection. The simulation test of the accelerated emptying model was conducted using MATLAB. This paper proposed an accelerated emptying of lane traffic to facilitate access for EVs using an historical approach method that applied past characteristics of traffic. Using the proposed model, the emptying process can be analyzed using the defined system indicator. The results showed that, where the normal vehicle speed before accelerated emptying was the same as the EV speed, the system indicator was at zero percent, thereby indicating no requirement for accelerated emptying. The same results arose for the negative indicator. However, where the system indicator was close to one hundred percent, requirement for the accelerated emptying process was necessary. Publication of the article was supported by the United States Agency for International Development (USAID) through the Sustainable Higher Education Research Alliance (SHERA) Program for Universitas Indonesia’s Scientific Modeling, Application, Research and Training for City-centered Innovation and Technology (SMART CITY) Project, Grant #AID-497-A-1600004, Sub-grant #IIE-00000078-UI-1.